The Red Pyramid is the third pyramid in Egypt by size and the largest one located in Dahshur, forty kilometers south of Cairo. It owes its current name to the reddish color of the stone blocks of its internal part was built. It was built by the pharaoh Sneferu, the founding pharaoh of the Fourth Dynasty. It represents the first successful attempt to erect a pyramid of smooth-sided, being the tallest building in the world at the time it was built. The original name was: «The bright pyramid». Local residents refer to the Red Pyramid as El-haram el-watwat. 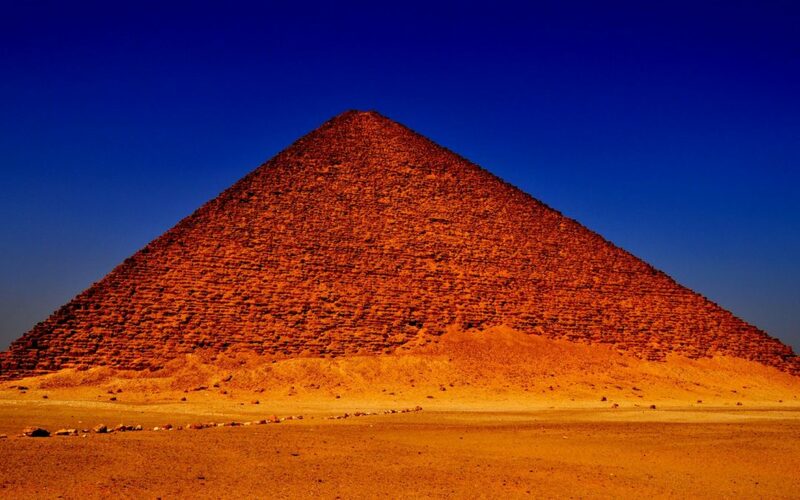 The Red Pyramid was not always of this color. It was covered with white stone blocks limestone of Tura, but only some remains in an area of the base of the pyramid. For years, this limestone was used to build the buildings of Cairo, thus showing the reddish color of the blocks of its interior structure. It was built during the reign of Pharaoh Sneferu to be his tomb, and is located one kilometer north of the Bent pyramid. It was built with the same angle of 43 ° of the upper section of the Bent pyramid, which gives it a noticeably flattened appearance compared to other Egyptian pyramids of comparable scale. 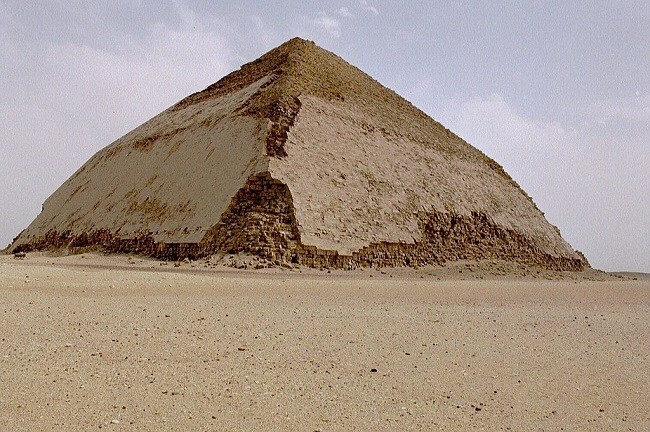 The archaeologists speculate that the reason for this may be a result of engineering crises experienced during the construction of the previous two pyramids of Sneferu. The first of these, the pyramid of Meidum, collapsed in antiquity, while the second, the Bent pyramid, had the angle of inclination altered from 54 ° to 43 ° in the middle of its construction. The funerary set is very simple and constitutes one of the rare private sets of satellite pyramids. The Funerary Temple, although of modest size, is similar to those of other pyramids. The first scientific exploration of the monument is due to the Englishman Perring in the year 1839, who made the first measurements and penetrated the inner chambers, making them accessible. After several archaeologists studied and excavated the area, but it was not until 1980 when a detailed study was made by German archaeologists, led by R. Stadelmann. 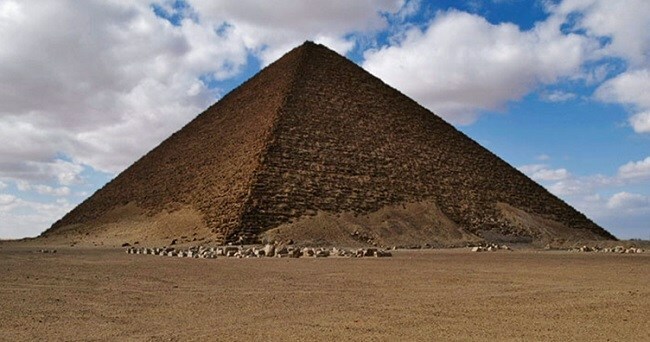 The pyramid is dated to the year 2582 BC. It has 3 interior chambers, placed in serious, which are accessed through the north side of the building. The entrance leads to a descending corridor of only 1.2 m in height and 27° 56 in slope. After just over 60 m the corridor becomes horizontal to arrive, about 7 meters later to the first of the chamber. This one has a rectangular base of 8.36 × 3.65 m with a false vault ceiling of about 12.3 m height. On its opposite wall is the entrance to the second chamber, which has practically the same dimensions, but with the peculiarity that it is displaced towards the west with respect to the anterior chamber. This displacement causes this chamber to be just below the central axis of the pyramid. 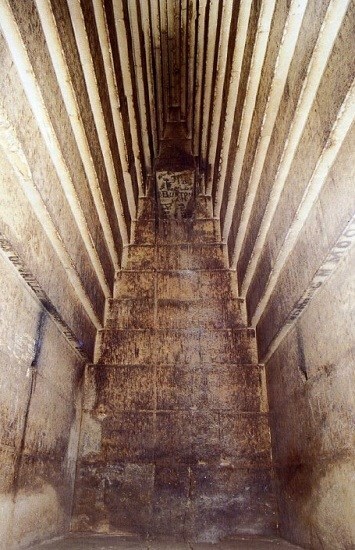 The third and last of the chamber is accessed through the upper part of the opposite wall of the second chamber. It is oriented from east to west, unlike previous ones that are from north to south. It measures 4.18 × 8.35 m and its roof, also by approximation of courses, has a similar height. No sarcophagus was found in any of the rooms. In the third of them, the remains of a man’s skeleton were found. It is probable that they belong to Sneferu, but there is not enough evidence to affirm it with certainty. Some archaeologists think that the pharaoh was buried in this last chamber, which was desecrated by the looters, who possible found only a wooden sarcophagus with the king’s mummy. Frustrated at not finding any treasure, they set fire to the sarcophagus. This would explain the remains of the skeleton and the obvious signs of a fire, found on the walls of the chamber. One of the most important findings made by the German team was the pyramidion “capstone”, that is, the stone that was placed at the apex of the pyramid, which despite being fractured in several pieces, could be reconstructed. It was made in a single piece of Tura limestone. 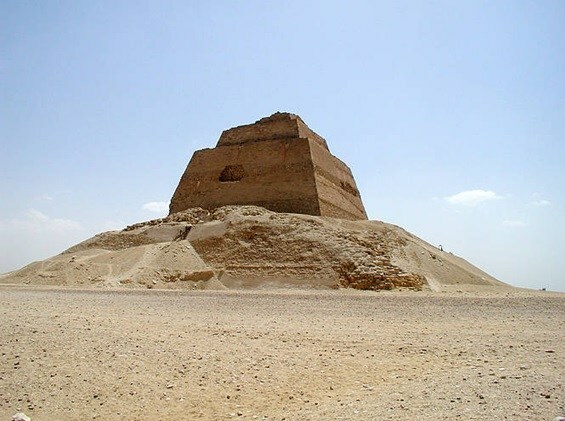 It has 3 cubits of base (1.57 m) and is the only known of the Old Kingdom. As a curiosity, the inclination of the pyramidion is slightly than that of the pyramid. When Was the First Egyptian Pyramid Built?